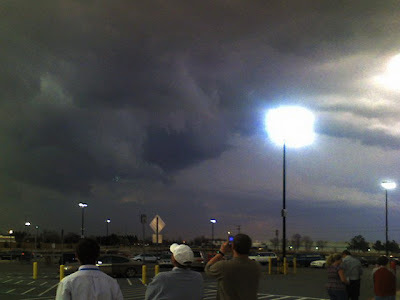 Last Thursday here in Bentonville, AR we walked out of the Sam's Club where we are working and we saw a crowd of people looking up at the sky. When I looked up there was a wall cloud. I guess these are associated with tornadoes. The base of the cloud was rotating...scary stuff. For the next 15 minutes or so we watched it pass by. It never did become a tornado. I took some pictures of it with my phone...not great but you get the idea. We've been having some nasty weather here. I guess this isn't uncommon for this time of the year.